Like a 'shooting star', little 'Genesee Valley Jane', had a short but memorable show career. She was also from some the very best pedigreed shorthair cats available in the fancy at that time. Silver Classic Tabbies were rare enough, but to get a good one was extremely difficult and her heritage reads like a veritable 'who's-who' of the Silver Classic Tabby world! In the short space of only five months, among other prizes, she gained 'Best Shorthair Kitten' seven times, 'Best Kitten' five times, 'Best Shorthair Cat' seven times, and 'Best Cat in Show, twice!!! 'Jane' was born on 14th April, 1908, bred by Miss Jane Cathcart, of the famous 'Black Shorthair Cattery', in Oradell, New Jersey, and owned by Mrs. Elizabeth L. Brace (Genesee) of Rochester, New York. In the register, her eye colour is listed as Greenish/Hazel and it is presumed that she was duly named 'Jane' after her renowned breeder. 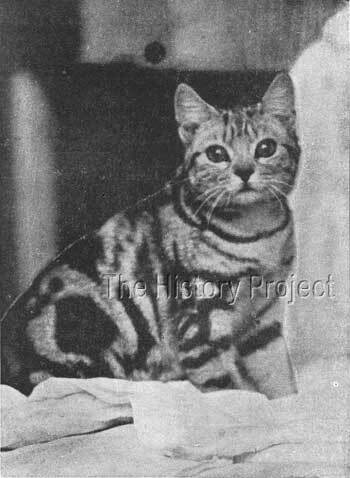 Her sire was Miss Cathcart's imported Silver Tabby male, "Ch. Silver Stripes" (1905) bred by Mrs. Collingwood of England. Her dam was Miss Cathcart's imported female "Ch. Dame Fortune II". So this breeding combination represented a line-breed on the famous English male, "Ch. James II" (1894), owned by Mrs. Collingwood, as both the sire of 'Silver Stripes' and grandsire of 'Ch. Dame Fortune II'. Little "Jane" therefore, had a most illustrious pedigree, going back in a direct line to 'James II'(1894), and to his sire 'Ch. Jimmy',(1890), (owned by Mrs. Louisa Herring/sister-in-law to Harrison Weir) and back another generation to "The King of the Fancy", owned by Mr. Young, but originally owned by Mrs. T. Sugden. (no date of birth is available for "King of the Fancy"). After Miss Cathcart had purchased 'Ch. Silver Stripes', Mrs. Collingwood offered to buy him back, but Miss Cathcart is recorded as refusing to allow him to leave America. Three siblings, one full, and two sire siblings are on record. "'Champion Genesee Valley Jane' was one of the most remarkable cats ever on the show bench in England or America, having won in her short show career of five months more prizes than any other cat can record..."
"Jane was first shown at Hartford, Connecticut, in 1908 at the age of 5 months. She started by winning first in her class, and best kitten in the show. The entire record of wins is as follows:-..
No progeny are recorded, and as little 'Jane' is listed in the article, (dated 1910) as 'The Late Ch. Genesee Valley Jane' , it is presumed that she died before having the opportunity to leave any progeny. In summary, as is so often the case with cats of such amazing quality, they are seldom both top flight show specimens as well reliable breeders. There are of course some exceptions. As can be seen in her photo, 'Jane' had exceptional head and body type, exceptional pattern, and a sweetness of expression enhanced by her lustrous eyes. When cats of the ilk and quality of 'Ch. Genesee Valley Jane' come along, they remind us that what we thought was only a possibility, was in fact, not only possible, but could indeed be achieved, both meeting and at times exceeding our expectations. And it is witnessing this, that usually sets us on a determined course, to deliver yet again on the dream. None available at the time of writing.